For a long time, when you entered a big supermarket, the entrance would be the aisles full of fresh fruit and vegetables, cut flowers and other ornamental plants. More recently, the entrance is often piled high with crates of bargain booze. This discounted booze is partly responsible increasing rates of alcoholism and British pubs going bust. Below cost selling of booze by supermarkets is outrageous, recently Tesco in Hexham, Northumberland had a customer offer of 15 cans of lager for £5 if they spent £30 on other goods. The Publican website is running the Make it the Minimum petition for a miminum cost of 50p per unit of alcohol. Once you have navigated round the cheap alcohol to the fruit and vegetables and nauseating neon cut flowers, the distinction between fresh and processed foods is blurring. In amidst the vegetables there are little plastic packages of gloopy stuff that is, apparently, salad dressing, and there is a whole section of prepared fruit and vegetables, encased in plastic with little plastic spoons like an aeroplane meal. The labelling of the ‘ready to eat’ fruit salads and sliced and diced vegetables has changed. For a while many of the labels read ‘produce of more than one country’, not just on mixed fruit salads and prepared combinations of veg such as for stir fries, this uninformative label appeared on some single ingredient products like diced or sliced pineapple. 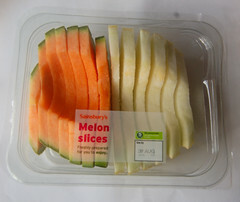 Now the labels on the prepared fresh fruit and veg in Sainsbury’s, like this sliced melon, says ‘produced in the UK’, or ‘produced in Ghana’ or wherever, i.e. where the last bit of processing was done, so as with traditionally processed food like tinned stuff, the provenance of the actual ingredients is a complete mystery.